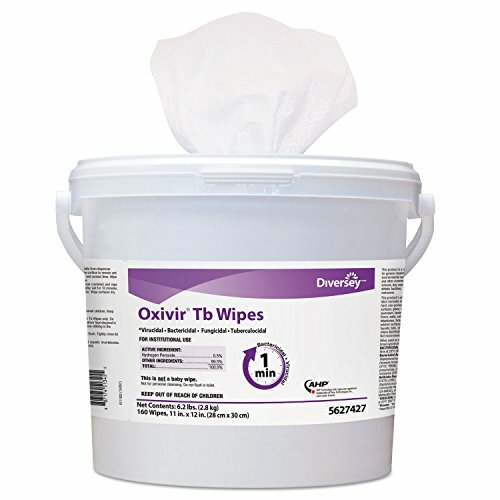 Diversey Oxivir TB Disinfectant Wipes, 11 x 12, White, 160/Bucket, 4 Bucket/Carton by Diversey at Blog Free Here. MPN: DVO5627427. Hurry! Limited time offer. Offer valid only while supplies last. Ready-to-use disinfectant cleaner wipe based on proprietary hydrogen peroxide (AHP) technology to deliver fast, effective cleaning performance. Ready-to-use disinfectant cleaner wipe based on proprietary hydrogen peroxide (AHP) technology to deliver fast, effective cleaning performance. Disinfects in 60 seconds. Virucide, bactericide, tuberculocide, fungicide and non-food contact sanitizer. Kills MRSA and Norovirus. Meets bloodborne pathogen standards for decontaminating blood and body fluids. No VOCs and no fragrance added. Towel/Wipe Type: Disinfecting Wipes; Application: General Purpose; Applicable Material: Hard Non-Porous Surfaces; Chemical Compound: Benzyl Alcohol. Ready-to-use disinfectant cleaner wipe based on proprietary hydrogen peroxide (AHP) technology to deliver fast, effective cleaning performance.